TEHRAN: Floods in Iran have killed 76 people and caused more than $2.2 billion in damages in recent weeks, officials said yesterday, with warnings still in place for large swathes of the country. 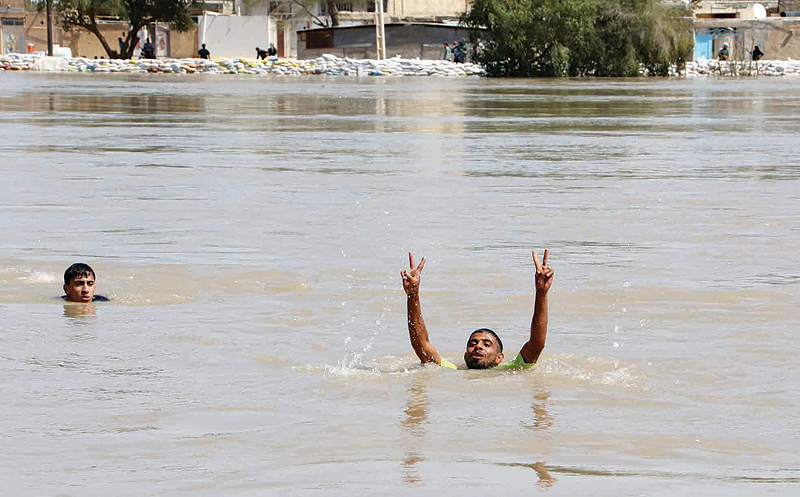 “With the death of five people in the Khuzestan province flood and another person in Ilam province the death toll has now reached 76” since March 19, according to a statement published online by the coroner’s office. The two southwestern provinces are the latest overwhelmed by floods that first hit the northeast of the usually arid country, forcing hundreds of thousands to evacuate from cities and villages. Officials have again issued flood warnings for the east of Iran with heavy rains that began on Saturday forecasted to continue. The floods have caused immense damage with homes, roads, infrastructure and agriculture all hit. “Twenty-five provinces and more than 4,400 villages across the country were affected by the floods,” Interior Minister Abdolreza Rahmani-Fazli told parliament, according to the official IRNA news agency. He said the damages amount to between 300 and 350 trillion rials – between $2.2 and $2.6 billion at the free market rate. Transport minister Mohammad Eslami meanwhile told lawmakers “725 bridges have been totally destroyed.” “More than 14,000 kilometers of roads have been damaged,” he said, according to IRNA. The head of Iran’s meteorology service told the same parliamentary session that the floods do not necessarily mean that a decades-long drought has ended. “The recent floods were due to climate change and global warming,” Sahar Tajbakhsh said according to the semi-official ISNA news agency. The Islamic republic has received aid from neighboring countries and further afield, with France on Saturday donating 210 tents and 114 pumps. Meanwhile, Iran will ask the international community to take a position on the US designation of its Revolutionary Guards as a terrorist organization, Foreign Minister Mohammad Javad Zarif was cited as saying yesterday. Iran condemned US President Donald Trump’s step last week as illegal. The Islamic Revolutionary Guards Corps (IRGC) is a powerful elite force which controls much of the Iranian state and economy. “Today … we will send messages to foreign ministers of all countries to tell them it is necessary for them to express their stances, and to warn them that this unprecedented and dangerous US measure has had and will have consequences,” Zarif was quoted as saying by state news agency IRNA. Zarif said he had also sent letters to United Nations Secretary-General Antonio Guterres and the United Nations Security Council to protest against “this illegal US measure”. Tehran retaliated against Washington’s move by designating the regional United States Central Command (CENTCOM) as a terrorist organization. Relations between Tehran and Washington took a turn for the worse last May when Trump pulled out of a 2015 nuclear deal between Iran and six world powers, reached before he took office, and reimposed sanctions. The United States has already blacklisted dozens of entities and people for affiliations with the IRGC, but had not previously targeted the organization as a whole. Revolutionary Guards commanders have repeatedly said that US bases in the Middle East and US aircraft carriers in the Gulf are within range of Iranian missiles. Tehran has also threatened to disrupt oil shipments through the Strait of Hormuz in the Gulf if the United States tries to strangle Iran’s economy by halting its oil exports. Iran’s oil minister said that the supply-demand balance in the global oil market is fragile due to US sanctions on Iran and Venezuela and tensions in Libya, and warned of consequences for increasing pressures on Tehran.